Red lettering and white skull and crossbone applique. I can do the lettering and/or applique in whatever color you like. Please see listing photos for available shirt color/size options. - What birthday should be listed on the shirt. - Any change/preference for fabric colors. - if you prefer long sleeve please indicate in this box. - confirm child’s name (if adding) along with fabric color preference. Your design will be created to order. We will contact you directly if we have any questions about your order. All shirts are available for birthday "1/2" "One" "Two" "Three" "Four", "Five", "Six", “SEVEN”, “EIGHT”, “NINE” “TEN” and up. 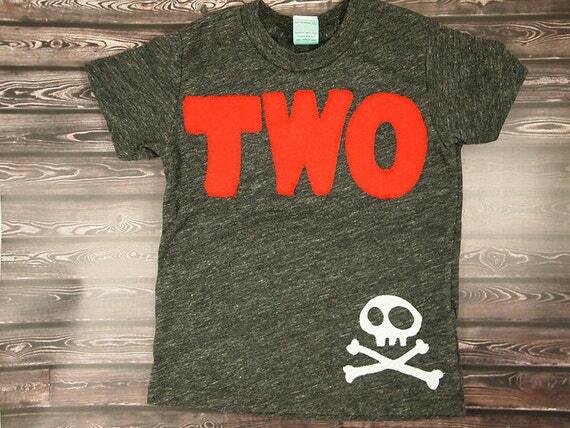 Additional birthdays and shirt sizes available as a custom request. The base price for each spelled out design includes 3 letters. Each additional letter is $2 per. Please see the sizing/color chart located in the photos above for information pertaining to available shirt options. Colors shown on sizing chart are also available in long sleeve. If you prefer long sleeve please mention your preference in the “Notes to Seller” box at checkout. Would you like a shirt in size 3-6 months? Youth sizes 8 and higher? Adult sizes? They are also available. Limited colors available. Please contact us with what size you are looking for and we can tell you what colors we have in that size. We can set up a custom listing for you to purchase as well. ***Based on availability the exact shade of the colored tees may vary. For example - heather blue, green, red, purple may be slightly lighter depending on what shading is available through our supplier. Each lil threadz design is made by hand, from start to finish. Each appliqué uses fun and unique fabrics and is sewn on to top quality shirts made right here in the US. The designs are hand-cut, applied to the shirts using a non-toxic adhesive and then sewn securely to the fabric. lil threadz is truly concerned about what types of dyes and chemicals linger on the clothes we place on our kids each day. Most of the shirts are super soft, eco-heather which is a uniquely imperfect blend of organic cotton, recycled polyester, and naturally occurring rayon. ***All of our designs are made using hand cut and stitched fabrics. Each garment is unique so although we try to replicate each design as much as the sample there may be small details that differ with each creation. ***There are times an exact fabric used for a sample design will be discontinued or altered. We try to make each design as consistent with the sample picture but depending on availability there may be a slightly different fabric used for your design. If this is the case with a patterned fabric with something like car, animal etc we will contact you regarding the change.